Analytical Armadillo: "Me Time" - When did it become critical? "Me Time" - we hear a lot about it. It's the essential time every mum must have, without which one cannot possibly mother adequately the rest of the time. The Baby Whisperer (original) clearly recognised this and handily built her routine EASY (Eat, Activity, Sleep, Your Time) - to of course help keep parents sane. I recently heard of a mum of a four week old baby, who had decided to place her daughter in nursery part time as she needed "me time". This was a much awaited and longed for child, yet only four weeks in mum was so overwhelmed she planned separation. Marketing bods of course also recognise mothers are busy and desire "me time", and so design a whole host of tools to assist - from dummies that attach to the mattress so a baby can put them back easily without requiring a parent, to ready made bottles and then bottle holders to feed the baby, because clearly feeding is a chore that can be delegated to an inert third party. 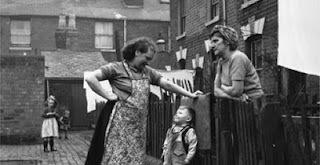 But recently I began thinking about a book I read a while back, "Call The Midwife" - a recount of 1950's East End London from the perspective of a midwife. These women had up to 14 children, they had communal washing/drying areas, their husbands were typically working or at the pub (no sharing of house work) and I wondered when did they get "me time"? Washing, mending, baking, - all without the many gadgets we have today; would they not marvel at how easy we have it in comparison? (and yes many mums work, but few do in the very early weeks) I wonder just how much "me time" these mothers had and how they managed without being committed to therapy? Whilst I'm not suggesting we revert to 1950's style parenting, or implying any mum who has an interest outside the home is anything other than normal, but is it realistic to expect lots of "me time" with a young baby? I began wondering does it in part come down to expectations? The reality is that first babies ARE an all consuming life changing experience - new parents often tell me how overwhelmed they feel and I remember being there! Perhaps today's typically smaller families mean there's a lot less first hand experience when young of what younger siblings were like? Perhaps the more nuclear set up means many have no direct experience of life with a baby pre their own? For whatever reason many parents pre baby believe he/she will just slot neatly into their existing lives, but this doesn't generally mean popping baby in a sling and taking them along. Instead it means their behaviours will be convenient to the parent - they will nap alone for X hours to give "me time", they will self soothe and cut night feeds ASAP so the parent's sleep is not disturbed. But 99% of babies didn't read the manuals their parents did; so they often need "training" or "manipulating" to conform; those that recommend this often failing to address longer term potential impact of their methods. Breastfeeding and responsive parenting may be biological norms, but I think there is a huge chasm between this and social norms and thus expectations. In order to come close to social norms, a whole host of books and gadgets may also be required - with parents feeling they are doing something wrong if they can't get their baby to fit! They can be told they are making a rod for their own back or must get tough - despite the fact this really is quite illogical! Which other mammal is born and fed by a holder (sometimes milk of another species), comforted by a plastic replica or cloth reminder of their mother, expected to put themselves asleep, and stay asleep for a specific amount of time somewhere away from their mother? Yet in comparison to many mammals, humans are extremely immature; the newborn's brain is only about 25 percent of its adult weight at birth, while most other mammals are born having 60 to 90 percent of theirs. Think how soon after birth some walk! James McKenna, Ph.D., professor of anthropology at Notre Dame University explains that when primitive women evolved to stand up on two legs, the shape of the female pelvis became narrower and resulted in human babies being born three to four months earlier, before their heads grew too large to pass safely through the birth canal. This has led to many believing there is a "fourth trimester" once baby arrives - the baby's only real needs warmth, comfort and nutrition. In some ways "baby rearing" is actually far more simple in less developed areas; mothers simply pop baby in a sling, feed them when hungry and they sleep when tired. No routines, schedules, expectations or rod making...It seems the more sophisticated our lifestyles become, the more we need time "off" to cope. We're such an individualistic society now and are encouraged to care for ourselves first before we care for anyone else. A favorite saying is "If momma's not happy, no one's happy!". CIO is justified because parents supposedly need their 8 hours of sleep in order to function the next day with the baby. In the 50's, family was put before one's own needs and wants. After being raised in a society that promotes the finding of one's self and happiness, spending an entire day or night devoting yourself to someone else feels like a major sacrifice and "me time" feels necessary. If we were raised to put others before us, like our grandmothers and great grandmothers were, an entire day tending to a baby would probably feel tiring but it would be a normal day, just doing what's expected, no treats needed or deserved. On the other hand, I don't think you can dismiss PND just because 60 years ago things were harder, and having a baby who doesn't nap anywhere other than a sling and only lets you get three or four hours sleep a night for long past those first few months is certainly going to contribute to the probability of that for most people. My son sleeps 2 hrs max at a stretch at night, he is 7 months. I'm nowhere near having pnd by the way. Some babies sleep, some dont. Me time is a long shower while daddy snuggles babs! I honestly dont understand people that expect to get their pre baby life back, surely having a baby is a new phase of your life?? Re PND - breastfeeding is supposed to make it less likely, and babywearing promotes breastfeeding, as does co-sleeping. Ergo, babywearing should make PND less likely. Also, doesn't mean baby won't sleep anywhere but the sling. Re 1950s parenting - I've often thought about this myself. Unfortunately, I think the pressure women were under at the time to do everything around the house, care for the children and still look presentable meant they resorted to tactics such as CIO and 4 hourly feeding schedules. This was the case with my gran, even though she did breastfeed. Also, she only fed for 9 months because doing it for longer than that was seen as 'strange'. There is still a hangover from all this today. When my gran sees me breastfeeding my 17 month old she asks what my friends say about it. My husband's gran keeps telling me my daughter will start biting me when she gets more teeth so I have to stop bfing. There are loads of ways in which the 50s childhood was probably idyllic, but I'm really glad that I'm not subject to the pressures that mothers were under at that time. As Bec said, having a baby is a new stage in my life, and I knew that things would change. I don't get how people think that they can bring another person into their families and not think that their lifestyles will change. Didn't their lives change when their spouse or partner entered their lives? And this is a full grown adult who's needs (in theory) are a lot less than a baby's. So, wouldn't it be logical that a baby would necessitate a change in their life as well?